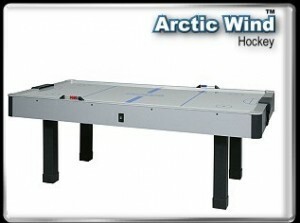 The Arctic Wind solid, no-frills table construction gives you rugged durability and an excellent playing experience. This professional-caliber air hockey table will be a winning addition to any home game room. Valley Dynamo applies its decades of experience in Professional Air Hockey to this sleek, affordable, dependable table. Players at any skill level will enjoy the high-quality features and its dependable, rugged construction.